Have you ever dreamt of sharing your boudoir with a pasty teenage bloodsucker...or Teen Wolf? 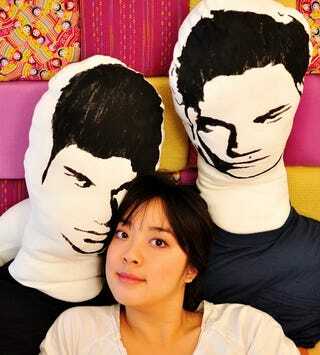 Your innermost fantasies are now a reality thanks to these Twilight "manllows" on Etsy. Bonus: they're from the torso up, so everything stays thematically PG-rated! Need a handsome shoulder to cry on after a long day of being the most middlingly average person at your high school? These Twilight "manllows" (man + pillows) fit the bill quite nicely. If and when they come back in stock on Etsy, you have the choice of Jacob (sans denim cut-offs, natch) or Edward (quasi-abusive emotional detachment not included). Incidentally, relationships with pillows are already somewhat of a phenomenon in Japan. Just another reason why Japan is the future here, dear readers.